One-year-old Dylan Janes of Lacey, Wash., said his first words, “I love,” shortly after his first birthday. (Say it with me: Awww.) He was right on track, developmentally; according to the First Words Project at Florida State University, parents report that 12-month-olds say from one to three words. Like Dylan’s mom, Tiffany Janes, parents of babies have to keep the video camera charged, because for most parents, this milestone is as exciting as it is unpredictable; nobody knows just when baby’s first words will tumble out, or exactly what they’ll be. But new neuroscience research is providing some clarity — insight that has implications regarding our understanding of language learning throughout childhood. According to breakthrough research from the Institute for Learning and Brain Sciences (I-LABS) at University of Washington, Dylan’s brain was probably practicing these sounds for months before he made his heart-melting statement. A new study released this past July suggests that infants’ brains are laying groundwork for early words and phrases as early as 7 months of age. In the study, researchers use state-of-the-art brain scanning (called magnetoencephalography; it’s noninvasive and completely safe for infants) to record brain activity in the cerebellum, the part of the brain responsible for planning and coordinating the movements required for speech. Brain activation patterns in 7-month-olds and 11-month-olds indicate that babies’ brains are hard at work on speech perception and speech movements long before the little munchkins say their first word. The study is the first major published research to come out of the Ready Mind Project from I-LABS, sponsored by the Bezos Family Foundation and established to advance research in six key areas: growing brain; critical periods of learning; diversity and bilingualism; behavioral transitions and milestones; early learning education; and early learning technology. The findings suggest that so-called “parentese” — that ubiquitous, sugar-coated, exaggerated speech we often slip into when we talk to infants (“Hoooow’s my liiittle baaaaaaaayyyyybeeee toooodaaay?”) — can benefit their speech perception at a time when new brains are rehearsing mechanics for speech, Roseberry says. This doesn’t mean using baby talk or made-up words, she notes. It means speaking distinctly yet slowly, to help babies understand. Other new research in early learning holds some surprises for parents, too. “The critical phase for learning sounds happens in the second half of a baby’s first year,” Roseberry says. If babies’ brains are particularly receptive to speech sounds during this developmental window, then hearing certain words and phrases over and over should boost language skills, and language-focused educational programming should be a baby-brain boon, right? Except, it isn’t. Research shows that “educational” videos and television shows designed to boost infant speech development just don’t. In fact, they can actually hurt speech acquisition. According to research by Kuhl, babies’ brains can pick up phonemes (distinct sounds that form words, such as “aw” or “er”) in their native language by 6 to 9 months of age. Creators of educational DVDs, including the Baby Einstein series, parlayed this research into educational programming that exposed infants to repeated words and phrases with the intent of strengthening neural pathways related to speech and boosting language recognition and acquisition. As it turns out, learning language isn’t quite that simple — and the DVD experiment didn’t work. In fact, studies show that spending more time in front of educational DVDs actually hurts babies’ language skills. In one study, each hour per day of viewing baby DVDs was associated with a 17-point drop in word recognition for babies 8–16 months old. The study used the MacArthur Communicative Development Inventory (CDI), an index of 89 simple words that babies may recognize and say, to measure language skills in infants and toddlers. A widely accepted benchmark for early language acquisition, it has been translated and used around the world. In other words, spending an additional seven hours per week parked in front of an “educational” DVD robbed six to eight words from a child’s vocabulary. That’s significant, because the average 11-month-old boy only recognizes 16 CDI words, according to NurtureShock: New Thinking About Children by Po Bronson and Ashley Merryman. 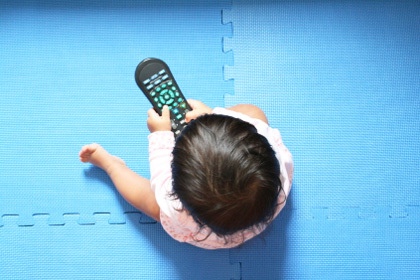 In a study published in Pediatrics, viewing television from birth to age 2 didn’t correlate with gains in language or visual motor skills at age 3. So why do language-focused baby DVDs — even ones based on research and noble intentions — fail to deliver? According to NurtureShock, it may be because babies learn speech partially by reading lips, and most educational programming features disembodied voice-overs that don’t allow infants to pair the auditory signal with the appropriate facial cue. At 7 months old, babies can begin to segment words they hear into phonemes, forming the building blocks of language. The caveat: They can’t perform this feat unless they’re looking at a face; if they hear a word while gazing at an abstract, it sounds like so much gibberish. So hearing the word “blocks” while looking at an image of blocks has less value than hearing — and watching — a parent say the word. So talking to your baby face to face is vital, and it has potential long-term implications in their acquisition and building of language and later academic success. But according to new research, it’s not enough just to send a barrage of words in baby’s direction in the parenting equivalent of a one-sided conversation. It’s important to pick up on baby’s cues, too. Researchers from New York University and the National Institutes of Health found that infants of mothers who responded to baby babble were a full six months ahead of those with less responsive moms. Echoing back a child’s vocalizations or picking up and naming an object that a child seems to be gesturing toward helps babies assign meaning to words, moving a baby toward fluent speech faster. In a Cornell University study, 9-month-olds with mothers who responded to baby babble in a back-and-forth, conversational way picked up and mimicked speech sounds faster than babies with less responsive moms. Another study from Cornell found that “object labeling” in infancy — that is, pointing to an object and naming it after a baby’s gaze meets the object — is linked to increased vocabulary in toddlerhood. The well-documented “language gap” between toddlers with larger vocabularies and those with fewer words widens over time. In a Stanford study, 18-month-olds from poorer families were several months behind their peers in language development; by 24 months, the same tots were nearly seven months behind. By age 5, children of lower socioeconomic status show a two-year delay in language development. To put the Cornell research into practice, observe what your baby is looking at (instead of what he’s trying to say, which is often misinterpreted, says NurtureShock coauthor Merryman) and name it: “That’s the kitty” or “See that tree?” Instead of wildly guessing about what a baby wants, it’s about following a child’s lead. Overzealous parents eager to stack the deck toward, say, a Harvard acceptance letter, take note: Researchers don’t recommend overstimulation. It’s not necessary to be in your baby’s face all day long. But responding and interacting naturally with baby in a conversational way has profound benefits, says Merryman. Using a pioneering brain-imaging technique called magnetoencephalography (MEG), I-LABS will measure the brain activity of parents and children while they engage and interact with each other. These and related studies will illuminate the impact of social and emotional interactions on the growing, learning brain. I-LABS is collaborating with the world’s leading geneticists to investigate the roles that genetics and the environment play in early development and to identify the conditions that expand “critical periods” for learning. I-LABS scientists are investigating the mechanisms of developmental change in the first 2,000 days of life. They will explore key achievements such as when children acquire the skills, customs and values of their culture, a self-concept, self-control and empathy for others. What predicts school readiness and success? How do we identify children with challenges and prevent them from falling behind? Longitudinal studies, from infancy through first grade, will enable I-LABS to create measures of school readiness and to identify problems early on, when interventions to address them are most effective. Under what conditions and at what ages might children benefit from the use of technology? What I-LABS researchers discover could be used to refine learning technologies, from computers to mobile phones, in ways that promise personalized learning in developing children. The Ready Mind Project is exploring how the experiences of children vary due to their gender, socio-economic circumstances and race/ethnicity, and how these experiences shape children’s attitudes, self-image and success in school and throughout life.